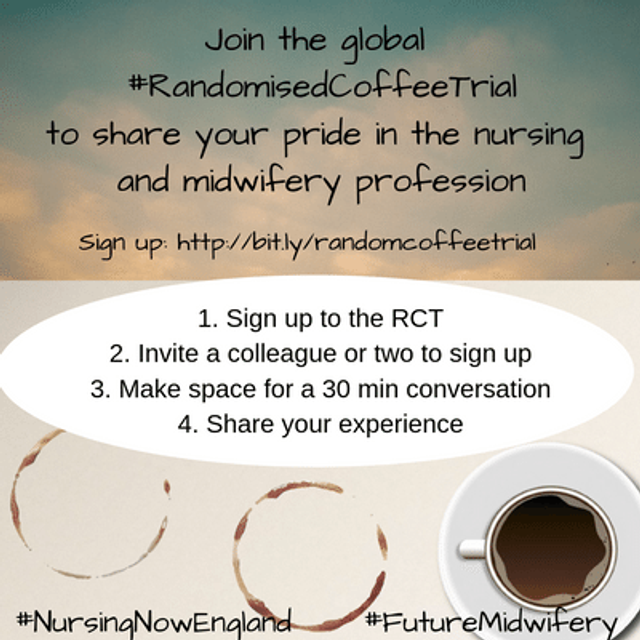 March is Randomised Coffee Trial (RCT) month for Nursing Now England and Transforming Perceptions of Midwifery Ambassadors: that is, our 30 Day Challenge is to run an RCT. We are inviting Ambassadors and colleagues interested in transforming perceptions of nursing and midwifery to join in the global RCT, aiming to create the biggest Randomised Coffee Trial ever! During your conversation you can share your pride in the profession, ways of building positive perceptions of nursing and midwifery and anything else that flows from that! Share your experience with us either on twitter using #NursingNowEngland or #FutureMidwifery, by writing a blog or dropping us an email. My colleague Zoe Lord recorded a helpful podcast to support nurses and midwives to host their own event locally. We have seen organisations, teams and colleagues at events getting together, having a conversation and sharing their pride in the profession. Ambassadors Claire Lawson and Jo Hockley took up the challenge and held their RCT on the Florence Nightingale Foundation emerging leaders residential and recruited new Ambassadors too! Get involved and share your pride in the profession. "@Debs_Word our article would never have happened without an RCT - never underestimate the power of coffee"
The March 30 Day Challenge is about having a #RandomisedCoffeeTrial to share our pride in the profession. How about we have one?